“From kids to adults” founder Flynn says, “everyone loves to dress up and become something different for a while, so ultimately we’re doing a kind of ‘Hero Building’ class.” While we can’t give you Force-like powers, we can show you how to do a handstand while balancing Yoda on your foot! And wield a light saber, of course. You can even learn how to make your own saber, any color you want! 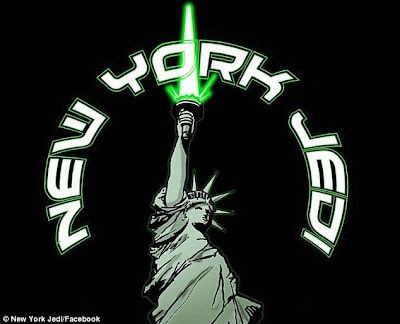 Saber choreo classes cost $10 apiece and the content varies based on whatever performance New York Jedi is preparing to give. They'll even teach your littles the skillz with their 5 week long SaberKids sessions. The kids' sessions don't come cheap: $360 for 10x2hr classes which is way more than any other martial arts program the Dude has ever done, but given the stage combat, the Jedi teachings, and the general *nerd* factor, I'm guessing that it must be a ton of fun. And the sessions end with a performance for family and friends. Now, I haven't been to one and I am convinced they must be the BEST. RECITALS. EVAR. We give you the exciting option of creating your own hero, from whatever source inspires you! We just focus on the whole light saber thing, and hanging out with cool dorks, geeks, newbs, whateveh! Now with all the bullying stories in the news and on the web, isn't that just a breath of fresh air? Light sabers, nerds and acceptance? I'm in!